The Defaults Addon will allow you to create a set of base settings that all galleries can use. Once your base settings are created you can just click Add New and add your images. Your new galleries can be created in just moments thanks to the Defaults Addon. You can even use this to bulk apply changes to other galleries as well with just a few clicks of your mouse. We’ll walk you through the steps on how to set up and use your Envira Defaults Addon. Does this change the settings of existing galleries or albums? Will this work for albums too? Platinum, Ultimate, Agency or Pro Envira license. You can read how to upgrade to one of these licenses here. Please follow our instructions on how to install and activate addons. In this instance, you’ll be activating the Envira Defaults Addon. 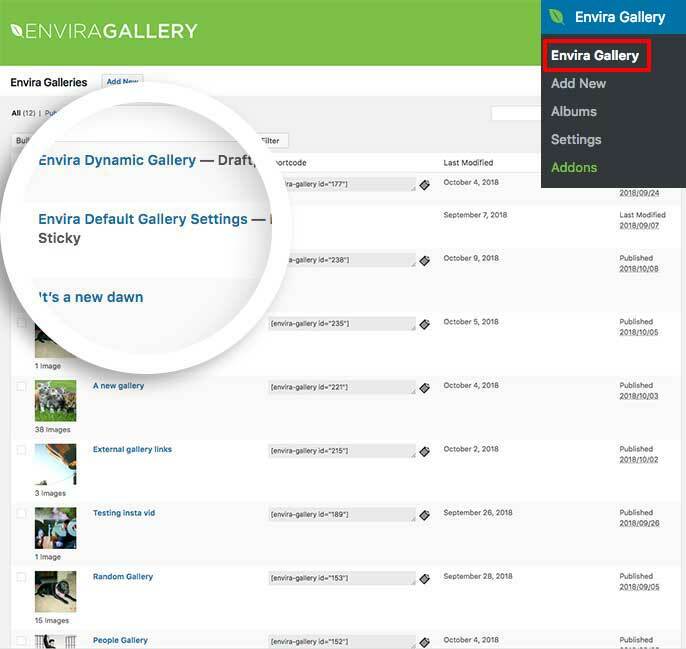 Your first step is to navigate to the WordPress Admin » Envira Gallery and selecting the Envira Default Gallery Settings to edit the gallery. Your next step is to set up your default settings. Simply navigate through each tab of the gallery and create your base settings that will be used for all galleries. Finally, you’ll just need to click Publish or Update on your gallery to save any changes you’ve made to your default gallery settings. You’re now all set to begin to use the default settings for all galleries. Would you like the ability to bulk edit your gallery images? Take a look at our documentation on How to Bulk Edit Gallery Images. Q: Does this change the settings of existing galleries or albums automatically? A: No, this will not change the settings of any existing galleries or albums automatically. However by using our guide to bulk applying default settings, you can manually change the existing galleries with the newly set up default settings. Q: Will this work for albums too? A: Absolutely! 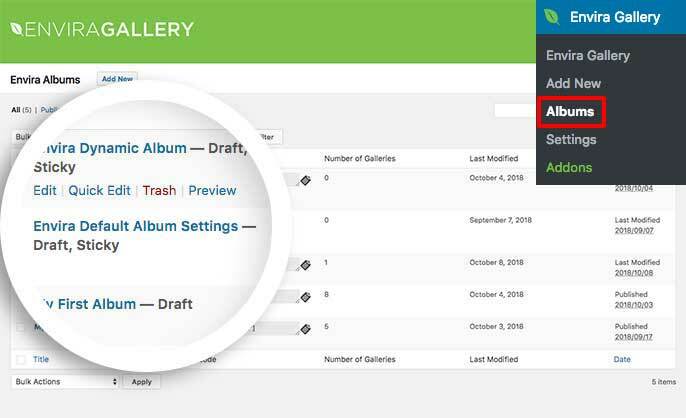 The same concept that applies to galleries will also apply to albums. You’ll just need to edit the defaults for albums as well. Fix: The sort by Filename and sort by URL added to settings. Fix: Sorting options for automatic layout added. Added: Change the Envira Default Settings gallery title for new installs. Fix: Sorting option on the Configuartion Tab for galleries. Fix: Use wp_get_sites() on initial activation rather than raw SQL queryFix: Don’t set Gallery Title and Gallery Slug when creating a new Gallery or Album (would potentially result in multiple galleries / albums with the same non-unique slug). Fix: Don’t set Gallery Title and Gallery Slug when creating a new Gallery or Album (would potentially result in multiple galleries / albums with the same non-unique slug). Initial release of the addon. Copyright © 2019 Envira Gallery, LLC. Envira Gallery is a trademark of Envira Gallery, LLC.